Completing the Moon Goddess costume was on my list, I had everything planned, but somehow the time space continuum warped and I ended up finishing the costume the night before the scheduled performance. Pressed for time, I took a couple of short cuts. I didn’t make the intended arm decoration, wearing crystal bracelets instead. I knew that the backdrop was black and with my dark hair and no crown I clipped a white flower in my hair. The matching white half circle veil was also made the day before the performance. All this for the grand total of 102 euro/ 110 usd. I worked app. 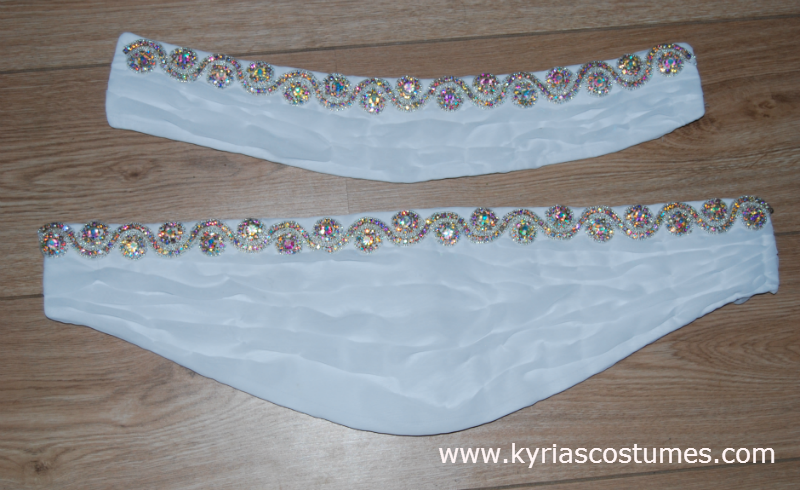 35 hours on the costume, if I paid myself 10 bucks per hour the total cost for this costume is 400 euro/460 USD. My friend Roos rented a small stage in a cultural center for her recital, with extra lights and sound equipment hired for the day. It was a warm day, but so much fun to meet up with her students and all my dance friends. The moon goddess performance is part of a story about mermaids living under the sea. Though they enjoy their tales, the moonlight draws them out of the water where they discover what it’s like to have legs. The moon in the background was placed there to support the story. I’ll have to do some more work on this costume to finish it. 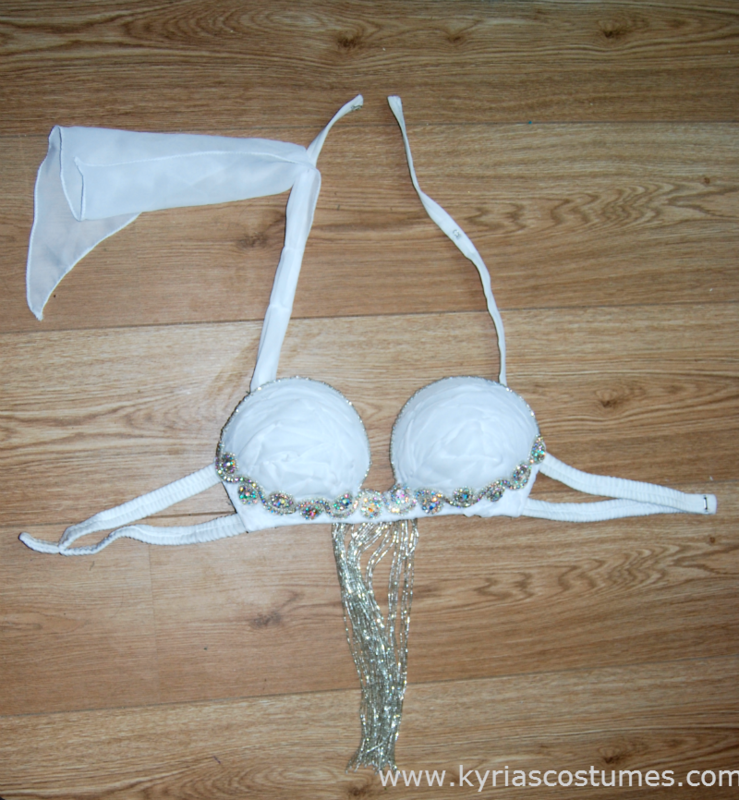 For starters the arm decoration, lining the bra and belt with satin in a different color (white smudges too easily). The drape that is intended to fall over the shoulder is flapping forward. Not the effect I intended, but it works. During this performance I am four months pregnant (18 weeks). I am a professional bellydancer and costume-a-holic living in the Netherlands. I enjoy blogging and am expecting my first baby in November 2015. If you enjoyed this post and like to kept in the loop, please like Kyria Bellydance on Facebook or follow me on Twitter. Leave your questions or comments in the box below, or let me know through Facebook and I might write a blog post to answer your costuming question. For the Minty Fresh costume I used a Dina bra base and as I usually order in bulk I still had a couple of bra bases lying around. They are made of a molded foam that is sturdy, yet easy to work with as I can sew right through it with my machine or by hand. These bases were bought on eBay, from seller ‘Egypttradediscount‘. I recommend this seller, and the bra bases. Be careful with custom made costumes though, some of the images on his listing look like they are made by Russian dancers. The bra base comes covered in white tricot, the same material white t-shirts are made off. It has elastic straps to the side and two non-stretch straps tacked on as shoulder straps. as I was in a hurry and my costume is white, I didn’t add extra fabric to cover the bra. I washed the bra in the washing machine before decorating as it had a bit of a funky smell. At a 40 degree celcius cycle, it came out perfect. The ruching of chiffon on the bra was harder than the ruching on the bra. The cups are domed shape and I was going for a sort of curved effect with the ruching creating ore curved lines. I wanted it to turn out neater. This will do though. Due to my pregnancy I have a bigger cup size. I used to ba a 70C, am currently a 75D and I expect that Mother Nature has some more surprises for me in the next months. It is amazing that I am able to fill a bra cup without adding lots of padding. I used a cup size D for this costume and I have a bit of room to grow. Not much room though, so I’d say the D cup is close to EU size 75D or 80D. I added the prebeaded rhinestone trim to the bottom of the bra and decided to leave one strap bare. 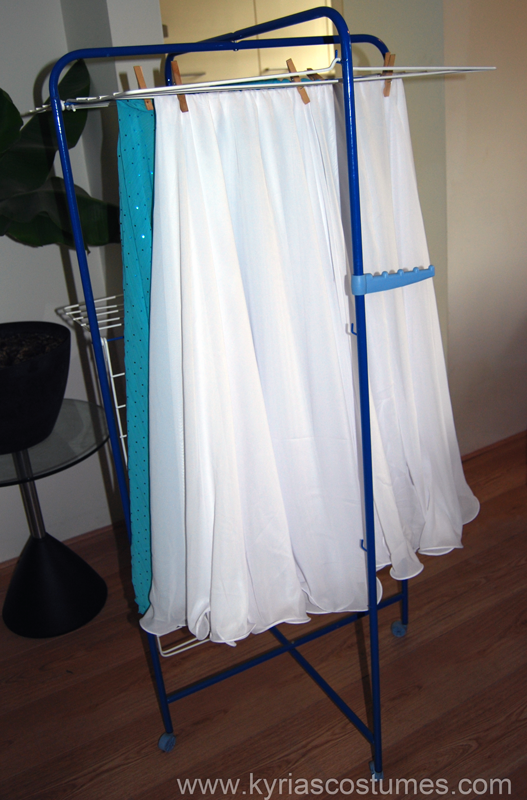 A left over scrap became the drape that covers one of the shoulder straps, then cascades down in folds. I left the side straps uncovered, thinking that I might have to make adjustments to the costume in the next couple of months due to size changes. Because of the elastic, the bra is very accomodating of changes in ribcage size and it is very comfortable. Unfortunately elastic has a limited life span and I will need to check the costume every time before wear to make sure it still has enough life left to stay put. In my experience, this type of bra strap has a life span between 3-6 years. I am a professional bellydancer and costume-a-holic living in the Netherlands. With my dog and husband I live in the suburbs. When I am not dancing or working on something to do with bellydance I am probably sleeping. If you enjoyed this post and like to kept in the loop, please like Kyria Bellydance on Facebook or follow me on Twitter. Leave your questions or comments in the box below, or let me know through Facebook and I might write a blog post to answer your costuming question.